All bowhunters know that climbing in and out of a treestand is dangerous, especially if you rely on those small screw-in style treesteps. During my 40 years of hunting, I’ve had two screw-in treesteps break under my 168-pound frame. Thankfully I didn’t fall to the ground because I was hanging onto the tree tightly with two hands at the time. Remember: Always have three points of contact while climbing or descending a tree. In addition to almost falling to the ground due to failed screw-in treesteps, I’ve also snagged my metal wedding ring on the edge of these treesteps. Not good! Thankfully, again I was able to quickly stop my descent before I got into trouble, but I’ve heard horror stories of hunters snagging their metal wedding ring on a treestep — think torn or even a severed ring finger. Groove Rings are available in a wide variety of colors, including camo (see below). If your wife sees you taking off your wedding ring as you leave home to “go bowhunting,” then you might have some explaining to do. I can’t help you with that. Then again, maybe I can. For far less than you paid for your gold wedding band, purchase a silicone Groove Ring. Before you walk out the door to leave on a hunt, carefully place your metal wedding band in a safe spot — hint: your wife’s hand is a safe spot — then slide on a Groove Ring in its place. Check out the entertaining clip below and you’ll learn all about it. Groove Ring is the world's first breathable active ring that is not only super comfortable but functional. Born from need, Groove raises the bar on traditional silicone, activewear rings with its flexible material, patent-pending, and breathable design. Groove is the active, silicone ring designed for the athlete, the adventurer — the bowhunter! All Groove Rings feature an inverse "comfort fit" arch that lessens skin contact, is safer and has zero chafing. They are resistant to most common chemicals including bug spray, gasoline, oil, diesel and household cleaning products, along with being non-porous, non-conductive, heat resistant and hypoallergenic. Big game blood? Again, no problem. 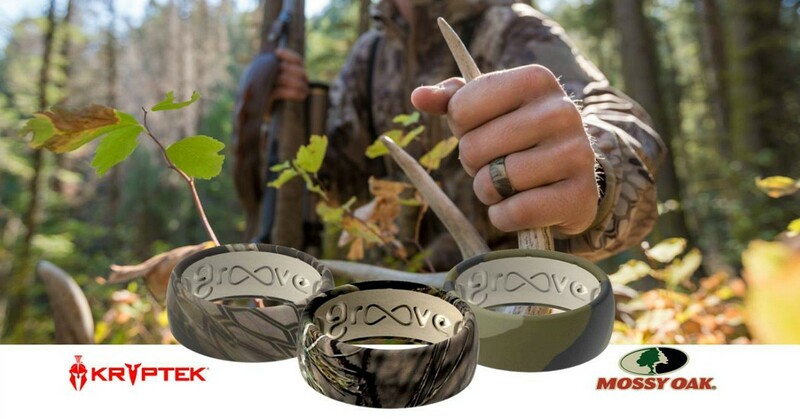 And the news gets even better: While Groove Rings are available in a wide variety of cool colors, you can choose a replacement wedding band in Mossy Oak or Kryptek camo (see video below). Each ring has a suggested retail price of $34.95. They are available at ​groovelife.com​ and ​local retailers. Don’t know your ring size? Click here to determine the right fit. This fall, don’t have a buddy follow YOUR blood trail from your treestand to your truck because your metal wedding ring snagged on a treestep or edge of the stand. Be safe. Get a Groove Ring. Better yet — buy one for your wife, too. DO YOU NEED AN ATTITUDE ADJUSTMENT? I DID.